When Marcel Mandos, artistic director of the North Netherlands Orchestra (NNO) approached Johan de Meij with the request to write a symphony for his orchestra, the composer always immediately knew what this new work would be about. His first symphony, The Lord of the Rings, has the trilogy of the same name by Tolkien as a guiding principle; his second symphony, The Big Apple, is an homage to New York City. In fact, this latter symphony was magnificently recorded on CD by the NNO conducted by Jurjen Hempel (QDisc 97035). 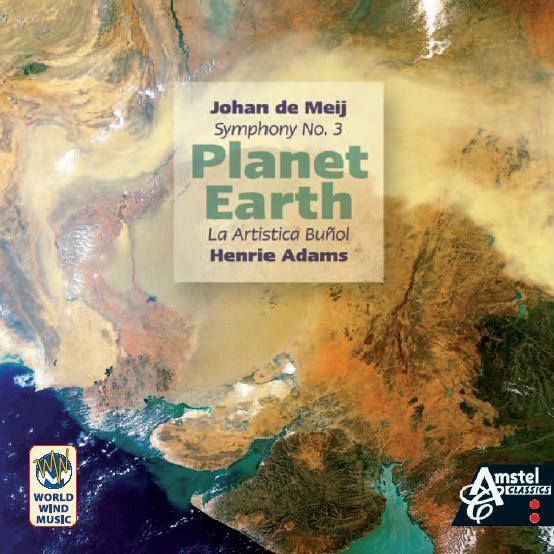 Planet Earth is the first symphony that De Meij composed directly for symphony orchestra: his first two symphonies and his cello concert Casanova were originally written for wind band, and later orchestrated. However, De Meij has always seen himself as a symphonic composer, because while his instrumentation is for wind players, the classical symphony orchestra has always been the guideline. Now that we have mentioned the opening movement, we approach the ‘lonely planet’ through a big bang that launches us into the universe. The comets and planets are all around the listeners in the opening part, through speakers that are placed around the audience. For those electronic sounds, De Meij has used the expertise of Joris de Man, who knew perfectly how to transform his wishes and fantasies in impressive extraterrestrial and eccentric sounds. mother of all, eldest of all beings. of the seas and all that fly; all these are fed of her store. substance that cheers the heart! Hail mother of the gods, o Gaia! and to take it away, O Gaia!